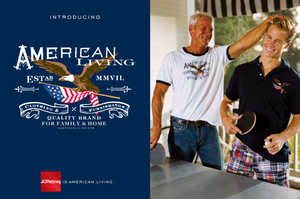 marketing push behind its new "American Living" collection! -Print campaign in the usual barrage of consumer pubs (see example, right). The brand and the campaign, both by Polo Ralph Lauren's Global Brand Concepts group, will be the biggest in the company's history, according to CMO Mike Boylson. The imaging is meant as an emotional play that connects consumers with images of Americana and family. While some may doubt the strategy of going big during a time when consumers feel like they're going bust—and Boylson said he's heard more than a few naysayers—the strategy actually works in their favor, according to Patricia Pao, of The Pao Principle, New York, who told me that J.C. Penney could potentially triple their media spend value given that they will be one of the few people making a real push. And even though she felt the price points for the collection—a broad swath covering $24-$500 goods—might be a bit too aspirational for the times, WSL Strategic Retail's Candace Cortlett told me that the big campaign is still a good investment in the brand. "[This effort] will live beyond the hard times," she said. "The worst thing to do is to put all of the energy into developing a brand like this and then just letting it sit on the shelf. That was Sears’ mistake when they got the Land’s End franchise."